* One-sided. Contains "Rough" and "Instrumental" mixes. ** Odd catalogue number (FAC 111C? Is it a typo?). Includes inserts. The tape was a semi-official promo. 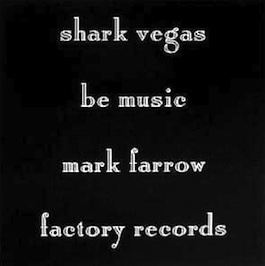 Notes: Shark Vegas were led by Mark Reeder, Factory's Manc representative in Germany (1979-1982). Originally recorded in 1984 at Conny Plank's studio in Cologne; 3 versions appeared as a 12" on the Totenkopf Schallplattenlabel in early 1985. Sumner remixed the song for the 3 versions that were released on Factory in January 1986.